Please verify your account before proceeding. In this lesson, we will learn how to evaluate a polynomial function for different values in its domain. Find the value of 𝑓 ( 8 ) given the function 𝑓 ( 𝑥 ) = 3 − 7 𝑥 . Evaluate 𝑓  5 7  given that 𝑓 ( 𝑥 ) = 3 𝑥 + 3 4 . 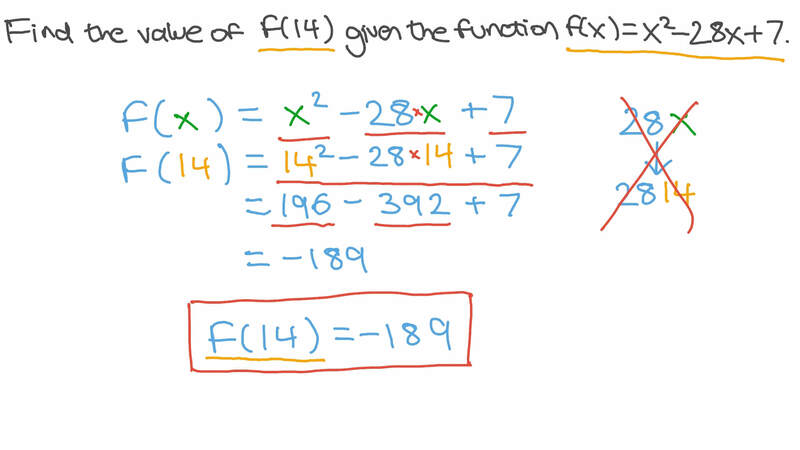 Find the value of 𝑓 ( 8 ) given the function 𝑓 ( 𝑥 ) = 𝑥 − 1 4 3 . 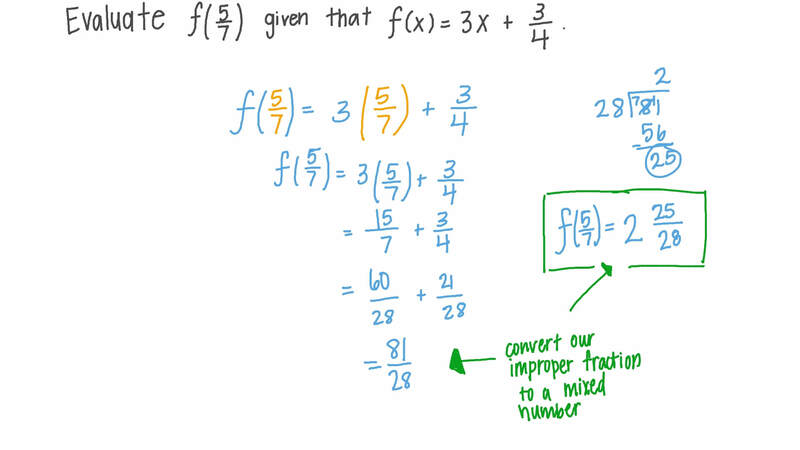 Find the value of 𝑓 ( 1 4 ) given the function 𝑓 ( 𝑥 ) = 𝑥 − 2 8 𝑥 + 7 2 . Find the value of 𝑓  √ 2  given the function 𝑓 ( 𝑥 ) = 𝑥 + √ 2 𝑥 2 . If 𝑓 ( 𝑥 ) = − 8 𝑥 − 3 𝑥 + 4 2 , find 𝑓 ( − 3 ) . Complete the given table of values for the function 𝑦 = 5 𝑥 − 2  . Find 𝑓 ( − 3 ) + 𝑓 ( 5 ) given 𝑓 ( 𝑥 ) = 𝑥 3 . Given the function 𝑡 ( 𝑠 ) = 𝑠 − 4 𝑠 3 , evaluate 𝑡 ( 4 ) . 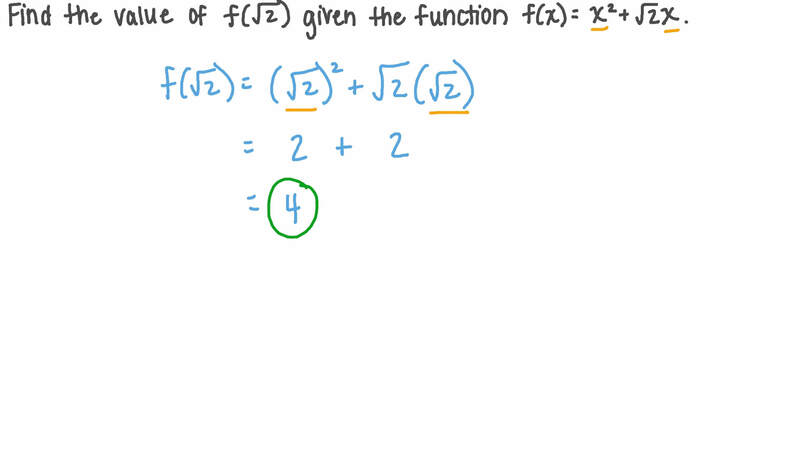 Find the value of 𝑓 ( 5 ) given the function 𝑓 ( 𝑥 ) = 𝑥 − 2 3 𝑥 + 3 1 2 . If 𝑓 ( 𝑥 ) = 7 𝑥 + 1 0 𝑥 + 4 2 , find 𝑓 ( − 1 ) . Nagwa is an education technology startup aiming to help students around the globe. Failed to resend verification email. Click here to resend it. This email has been registered but not yet verified. If you didn't receive the verification email, click here to resend it.